Two decades ago Kerry Brown’s father had a vision. 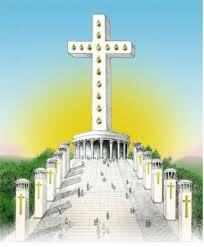 A vision that he should build the world’s largest cross in the heart of the Ozark Mountains. Thanks to Kerry’s determination that dream (known as Images at the Cross) is one step closer to fruition. The land has been acquired, the rezoning completed, and the 501c3 status bestowed. All that remains is to raise the estimated $5 Million to begin construction on the 200-foot structure to be located just outside Branson, Missouri. The final plans would have visitors riding up in one of the two elevators inside the structure and interacting with displays all while enjoying the panoramic views. The ultimate goal, according to the website, is to create “an engaging Disney-like family friendly production for entertainment and education centered on a first class multimedia and sensory experience.” The cross will overlook Interstate 65 and the group expects to draw in millions of visitors each year. In order to fund this vision, Images at the Cross offers various levels of sponsorships ranging from a $50 certificate to a $5,000 inscription prominently-displayed in the monument’s first-floor dedication room. If you are going to drop more than $5,000, they just want you to call. I am somewhat torn about the project. On the one hand, it seems like a creative method of presenting the gospel narrative to the un-churched. This man had a vision and has gone about making that vision a reality through private funding, the same entrepreneurial l model that produced The Snuggie or Melrose Place. On the other hand, how many people within driving distance of Branson, Missouri are not familiar with Jesus? Don’t get me wrong, it is entirely possible that the Lord came to this man in a vision and asked him to construct a Christian symbol tall enough to endanger single-engine aircraft I just feel that a solid community of discipleship might be a more effective route of evangelism. The interesting part is the problems and solutions section. I agree that the frequency of failed marriages is troubling, but I am not sure if a 200-foot cross nestled in the Ozarks is going to affect the national divorce rate one way or the other. Do any of these marriage dissolution documents cite “lack of enormous cross” as the primary source of estrangement? I suppose if we place enough single parents in a small elevator for long enough some of them could hit it off and reconstruct a nuclear family, but that is a long shot. It is difficult for me to accept that there are not better uses for $5 Million dollars. Perhaps a donation to St. Jude or a homeless shelter might provide a more lasting impact, but if we are going to go big then let’s do it right. I am proposing at entire Biblical theme park where families can experience their favorite scriptures brought to life. The Stoning Station – you are given seven rocks and your objective it to strike as many harlots as you can. Winners take home a plush replica of John the Baptist’s head on a decorative platter. The Whore of Babylon Coaster – A ride so intense you’ll break all seven of your seals at once! Elijah’s Gravity Drop – Experience the great prophet’s ascension with this intense 15-story free-fall. Noah’s Log Ride – Look out for the floating carcasses of your friends and neighbors as you ride the flood waters to dry land. Just don’t plant a vineyard when you get there! Pharaoh’s Chariot Challenge – Chase down those pesky Hebrews before they get to the Red Sea! If all that Biblical fun gets to be too much, you can stop off at Lot’s Salted Nut Stand or Mt. Carmel BBQ for a little refreshment. For couples there is Herod’s Resort, a no-children allowed paradise. Mingle with other couples at the Forbidden Fruit Smoothie Bar or dance the night away at Rahab’s Rave. Don’t forget to ask the concierge about the Bathsheba suite equipped with a rooftop hot tub.